So where does Yellow Goat come into the equation? I know what you’re thinking: Yellow Goat and Lincoln Automobile are an unlikely alliance. Quite the contrary, my friends! We may not have Matthew McConaughey on our team (#brilliant, by the way)...but we DO have Conrad Johnsson, our Australian Design Manager (similar features, don’t you think?)! YGD and Lincoln share quite a few core commonalities, which is why they chose us to design and incorporate a #clutch fixture to suspend above the focal connectivity bar. Exhibit A: Our “Bagels”, made from aluminum composite and measuring ø1’-4” each. 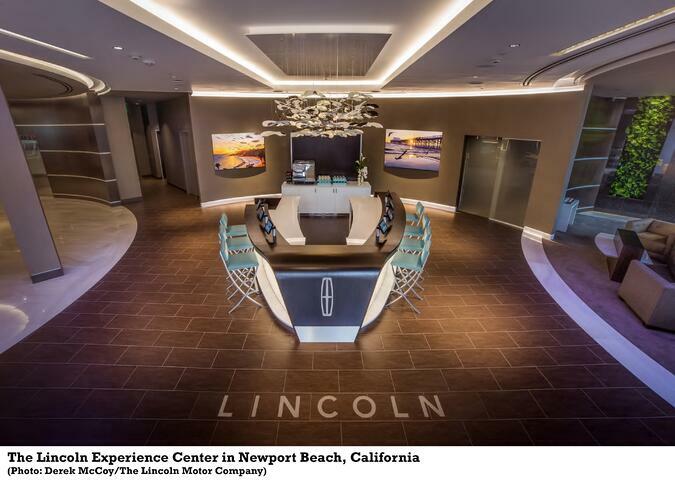 We collaborated with the Lincoln Team and Cityscape Architects to create an installation that spans 11’-0" long x 6’-0" wide with an overall drop height of 4’-6”. The ceiling plate is painted Benjamin Moore “Super White” in high gloss with twenty-two 1.2W LED bi-pin droppers scattered strategically throughout. The fixture is well suited to the brand’s aesthetic: luxurious, engaging and seamless. 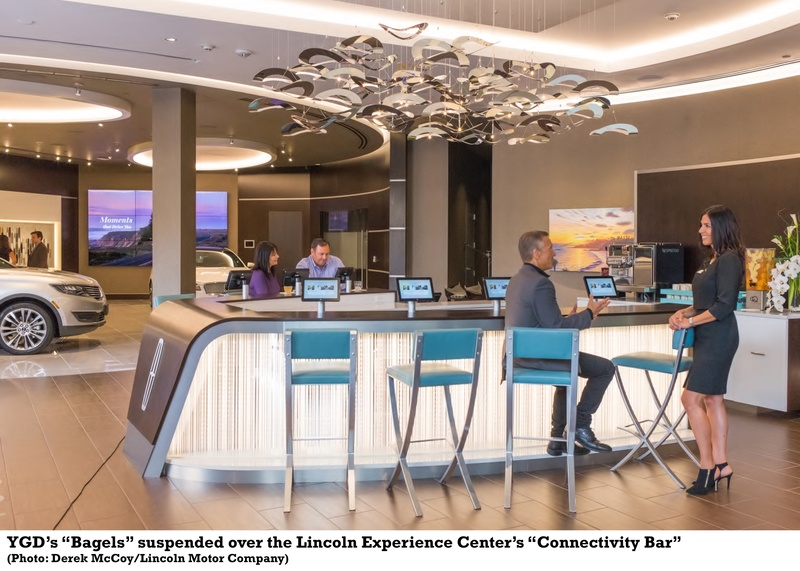 Lincoln’s Experience Center drives home (literally!) a few points that YGD can totally attest to, according to Laura Schreffler with Haute Living NYC (see article here): 1) taking the designs for a spin; 2) customization; 3) luxury offerings and 4) the story. Here at YGD, we will send you samples (so you know what you’re getting! ), customize nearly anything, fabricate the most high-quality products and design lighting, screens or kids play that tells a story, engages your client and enhances their experience within the space. If you are one of the 16 million visitors to this shopping destination, pop in and let Lincoln pull out the red carpet (and don’t forget to snap a pic of our “Bagels” for Instagram w/ the hashtag #lecnewportbagels)! If you’re lucky- you might run into McConaughey himself! 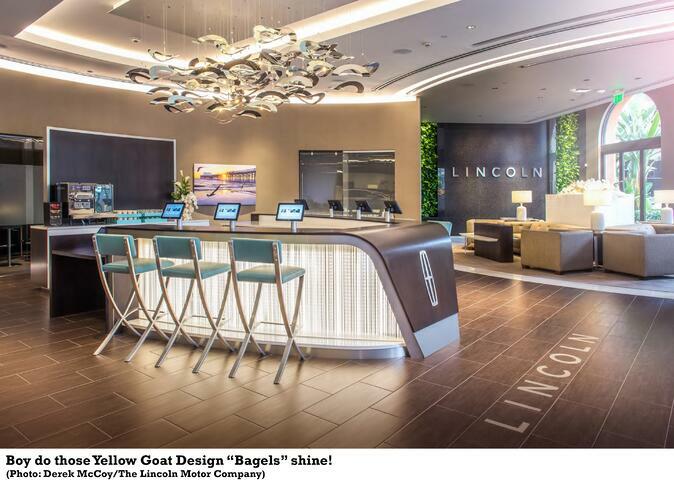 Discover the Lincoln Experience Center at http://lincolnexperiencecenter.com/ and watch the video here (where you see YGD's “Bagels” front and center! ).